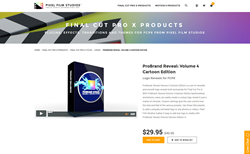 "ProBrand Reveal Volume 4 allows FCPX users to create and customize any logo idea they have while incorporating a unique cartoon styled animation," said Christina Austin - CEO of Pixel Film Studios. ProBrand Reveal Volume 4 Cartoon Edition is a set of versatile and smooth logo reveals built exclusively for Final Cut Pro X. With ProBrand Reveal Volume 4 Cartoon Edition keyframeless animations, users can easily create a unique logo reveal in just a matter of minutes. Custom settings give the user control over the look and feel of the various presets. Use these title presets to add a uniquely animated logo to any photos or videos. Pixel Film Studios makes it easy to add any logo to media with ProBrand Reveal Volume Cartoon Edition 4. ProBrand Reveal comes packaged with 90 unique animations. Each one of these animations bring in its own personality. Users can modify different settings such as shadows and background color to create a different feel. 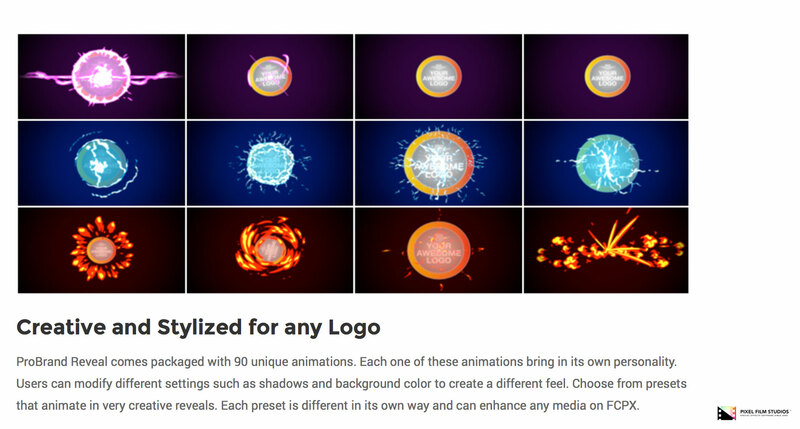 Choose from presets that animate in very creative reveals. Each preset is different in its own way and can enhance any media on FCPX. 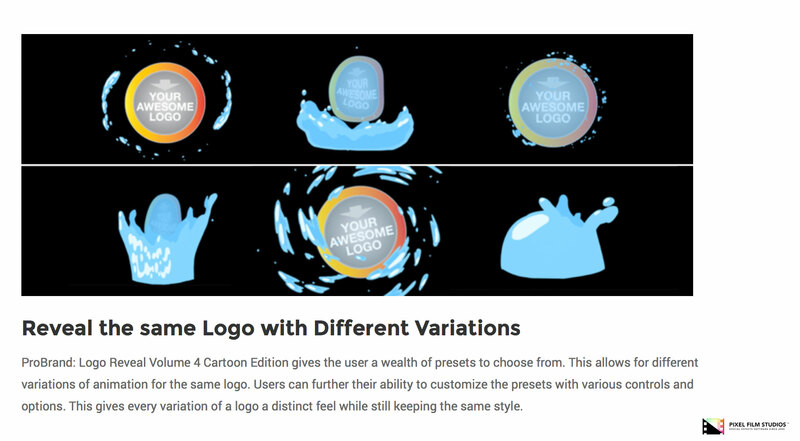 ProBrand Reveal Volume 4 Cartoon Edition makes customizing easy for users. Various sliders and color wheels are located in the inspector window. These controls allow users to modify certain aspects of the presets such as the shadow and the background color. The included on screen control allows for easy placement and scaling. 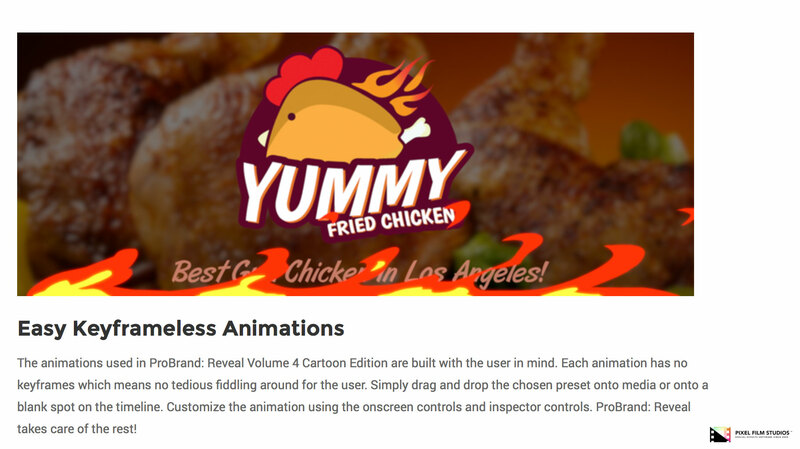 The animations used in ProBrand Reveal Volume 4 Cartoon Edition are built with the user in mind. Each animation has no keyframes which means no tedious fiddling around for the user. Simply drag and drop the chosen preset onto media or onto a blank spot on the timeline. Customize the animation using the onscreen controls and inspector controls. ProBrand Logo Reveal Volume 4 Cartoon Edition gives the user a wealth of presets to choose from. This allows for different variations of animation for the same logo. Users can further their ability to customize the presets with various controls and options. This gives every variation of a logo a distinct feel while still keeping the same style.